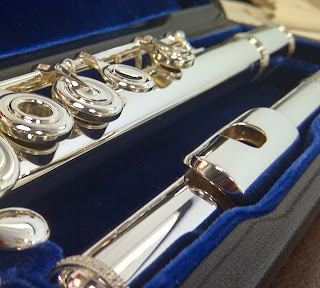 Repair My Flute: Flute Lip? Our sales associate said that she had experienced this mark her entire life, even when she started playing flute as a young girl. She played on plated flutes, silver flutes, and is now playing on a gold flute. The problem still occurs, and we have read that there could be a couple of causes -- the pH of her skin, chemicals in her makeup or facial creams and cleansers, or both. Essentially, something (and most likely her skin) is reacting with the metal and causing a black tarnish mark. We'll kexplain more as we continue our research, but this week, we thought we could tackle at least one of her other questions, which was, "Should I cover my lip plate with clear nail polish?" Hmm... Well, we read several forum discussions where flute players suggested the clear nail polish, so we went to our repair technician, Rachel Baker, to get her opinion. She said that she does not experience the "flute lip" other than at times when she plays headjoints that were just polished. 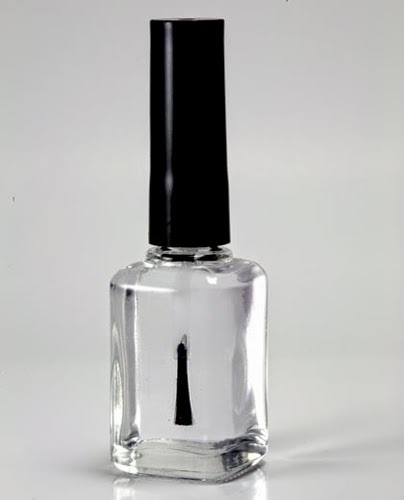 She said that she thought the nail polish might "feel weird" and flake off, too. But, was it safe to do? Can you really put nail polish on the lip plate? The answer is yes and no. In fact, Rachel told us that she gets several flutes in the shop that have small nail polish marks on the headjoint and barrel to help the player align the headjoint properly. She said that when she gets these flutes in, the nail polish comes off when the flute is cleaned in the ultrasonic cleaner. But, there is one caveat -- this is only the case with flutes and headjoints made from solid precious metals. She said that if a flute or headjoint is plated, that is a completely different scenario, and she always advises to use caution because she says, "You never know what kind of plating it is exactly, how thick it is, and what is underneath." In the case of anything plated, she says, "If you are going to put something on and take it off, there's a possibility that the plating could come with it."